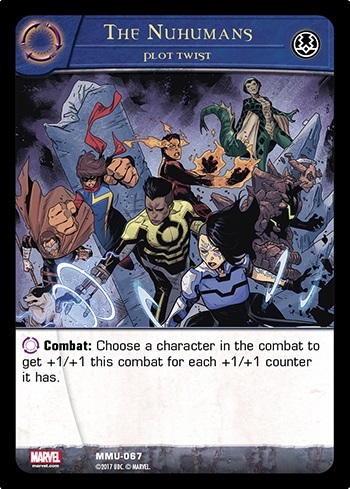 We have 2 spoilers for you today from the Inhumans Faction for VS2PCG Marvel: Monsters Unleashed. FLINT!!! How good is this dude? Stats are in line for the 4 drops that seem to "Do things". Star Hawk, Venom, Cap Britain and Sabretooth are all "Good" 4's that share his stat line. He comes with Terrigenesis so can comp his stats at the cost of being ready the turn he comes into play. He can really comp his stats by stealing everyone's counters for ! So depending on how many of those Terrigenesis dudes you have left or if you OR your opponent has been playing the "Pile on counters game" you can end up with a massive dude that just so happens to have flight!!! Imagine you have Meggan all buffed up. Flint can take her counters (and everyone else's) and then she can get em' all back! I know this requires a ton of green... But that's ok when you can Play The New 1 Drop Capn' and make one of the greens free... and get 2 more counters while you're at it! I expect to see this guy doing cannon balls of the side of the pool at Gen Con...(That's how much splashing this dude is gonna do). If you can fit green in your list... I would at least play test this dude and see if he is worth a slot. Pair this with the new plot twist "The Nuhumans" and your are gonna be building a defense your momma gonna be proud of! Nuhumans may very well find a place in a reincarnation of Groot. Groot finds himself at 18/18 pretty often after he gets to level 3. He has an option of "You are Groot" if he stays on team... but if you wanna go all splashy with the tree-man here is an answer to Charlie 27 and big ol' Thors. Now you can go off team and still just get bigger than they can. Do I think that EVERY Inhumans deck is going to run Nuhumans? Nope... 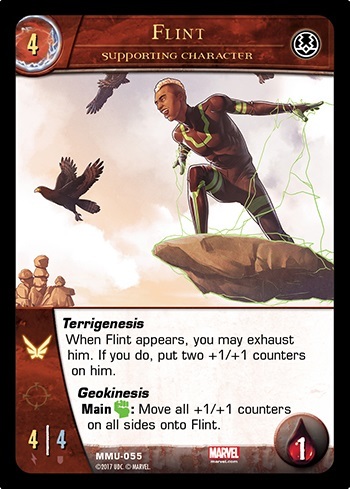 But if you are gonna run a Nuhumans centric deck (Terrigensis dudes) then I think at least a pair of this card should find its way into your list. At worst, this is going to end up being an Earths Mightiest Heroes, at best... well the sky is the limit. What makes me double think this card is what's gonna happen if a clever Thor player gets this to fit snuggly in their list? We are going to have to look for out of combat or "trick" stuns to take out lightening-man once he starts to get on counters? Thanks to Upper Deck for the opportunity to preview such awesome cards! Thanks to Pauper Tim for Posting this! Thanks to the community for making this kind of stuff so fun! See Ya'll At Gen Con!!! !